FSphere: My Pursuit of Lesel Olive Soap is Finally Over!! Today was a late start. I slept in this morning as I stayed up late last night. As promised yesterday, I got back to studying after writing that entry and did some housework afterwards. It's a nice feeling when you get something done, you see. This afternoon, I studied about an hour and then went out. There were a few things I needed to do. For a start, I went to the local general practitioner (often called GP for short) and made an appointment for friday. Then I drop by the greek supermarket across the street to top up some agno olive oil soap bars that I've been buying for general use. They're not as good as the Lesel soap I got from Japan in April last year, but smelt the same and were mild enough for everywhere except my face (They are a bit harsher as they contain sodium chloride). Since I used the Lesel soap, I'd been searching if I could get some in Australia, but I couldn't find any information whatsoever on the Internet. There were some sold in USA, UK and Japan (Lesel soap is extremely popular among Japanese skincare freaks) but none of those online shops ship them to Australia. With Lesel soap too hard to get, I resolved to try Itarian brand Olivella because users' reviews were positive - it contains no harsh chemicals but 100% virgin olive oil, no perfume. The price was quite expensive, but when we tried it the result was not too good. I could use Lesel and Agno soaps for hair, face and all over my body, but not with this soap. It left my hair completely dried out and pimples started to show on my back. So I finally decided to get my family to send some Lesel soaps from Japan. To my great surprise, I found the familier package at the greek supermarket. The soap bars looked and smelt like Lesel soaps. 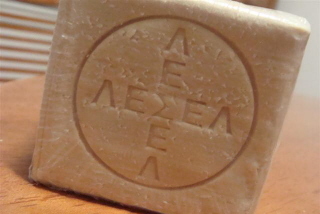 The logo was different and logo that is engraved on the soap was in Greek. I wasn't sure if it was Lesel soap, so I asked my friend who's married to a greek guy to help me read what's written in Greek. I was over the moon to discover that and bought 4 packs straight away. When I got home I fell uncertain again, because the lady in the logo looked different from the one I got from Japan. I went to LESEL website and relieved to find that label on the LESEL olive oil. The price was $4.75 per pack of 4 bars (373 Japanese Yen). That is less than half the price of the ones sold in Japan. The shop owner told me that the importer is Greek, so he imports those manufactured for the domestic market in Greece. 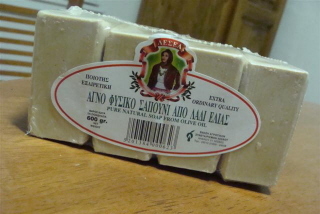 If you are a fan of Lesel soap, I suggest you to check out your local greek stores to see if they stock any, because there's a chance that you might stumble on it like I did.